Leading Parts and Warehouse Products Distributor Announces New Resource For Customers To Order Needed Items 24/7. "This represents the next logical step in the expansion of our already impressive parts business." -Eric Walker, VP of Parts Operations for Modern. 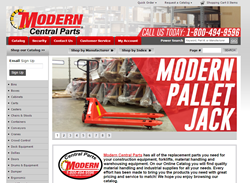 Modern Central Parts is proud to announce an Online Catalog with thousands of products for sale. Customer will find a vast assortment of warehouse and industrial products from leading manufacturers, all of which can be ordered online or by phone with nationwide delivery or local branch pick-up. The catalog is open 24/7, greatly expanding the coverage times provided by Modern Central Parts. Payment can be rendered any major credit card or being added to any Modern customer's account. All orders are processed by a Modern Central Parts team member. A parts specialist will coordinate delivery options and payment terms with every order. "This represents the next logical step in the expansion of our already impressive parts business" said Eric Walker, Vice President of Parts Operations for Modern Group. "Our customers want ever easier and quicker ways of getting the part or product they need for their business. We've already seen the power of online retail across so many other industries, the industrial equipment business will be no different. Modern Group, one of the nation’s leading equipment distributors, provides sales, leasing, short & long term rental, service, parts, training and financing solutions through its forklifts, power systems, arborist, construction, and warehouse products businesses serving Pennsylvania, New York, New Jersey, and Delaware. For more information visit http://www.moderngroup.com.